More recycling could be putting binmen at risk, with long periods between collections allowing dangerous emissions to build up. As the push for better recycling grows more people are being encouraged to sort their waste, potentially putting paper, glass, metals, plastics and vegetable matter for compost in separate sections. But Scandinavian scientists have found that the organic waste was causing problems as the fortnightly collections allowed it to degrade and putrefy. They noticed that during the working week the respiratory tracts (windpipe) of the refuse collectors were much more inflamed than after they had rested for the weekend. And they said that the study, which was carried out over a short period could indicate serious health problems developing over the longer term. 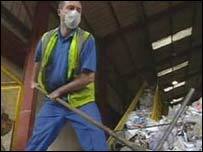 British experts say it is less of a problem in the UK, where most refuse collection are carried out weekly. Each year Norway produces 1.3 million tonnes of household rubbish, which is originally sorted by the householder and then stored in their home before being collected each fortnight. Because the organic waste was only collected fortnightly the scientists from the Norwegian National Institute of Occupational Health, in Oslo, the University of Oslo and the Department of Environmental Medicine of Gutenberg University in Sweden, found that the waste had begun to degrade and putrefy, releasing potentially dangerous discharges. These discharges, called "bioaerosols, contain numerous bacteria and fungus. The scientists studied 25 workers from a household waste collection firm, twice a week over the course of two summers. They were scanned on Mondays after a weekend rest and then again on Thursdays after three days work. While at work they wore a special device to measure their levels of exposure. Their respiratory functions and lung fluid samples (sputum) were then studied for inflammation. The refuse collectors also completed a questionnaire on any respiratory problems they had noticed. The results, published in the European Respiratory Journal, showed an increase of inflammation in the respiratory tract over the course of the working week. Author Wijnand Eduard, of the Norwegian Institute of Occupational Health said the study had produced some important research. "This study is probably the first using induced sputum that found signs of an inflammatory response in the lower airways among waste handlers. "Even though bioaerosol exposure remains moderate during collection of organic household waste, it unquestionably leads to bronchial inflammation." But he said more studies were needed. "This study was based on short-term exposure and effects and it is speculative to extrapolate as to the possible long-term exposure. "However, chronic inflammation of the airways, as occurs in chronic exposed workers in other fields, may subsequently result in chronic respiratory symptoms and chronic loss of lung function. "So our results indicate that there is a possibility of accelerated lung function decline in the long run and a risk of obstructive respiratory disease. "Such long-term consequences should be examined in further studies." Councillor Kay Twitchen, chair of the Local Government Association's Waste and Environmental Management Executive said the health risks highlighted in the Norwegian study should not apply to refuse collectors here. "In most cases, local authorities in this country operate a weekly collection of household waste and the common practice is for biodegradable kitchen waste, for example, vegetable peelings and food scraps to be mixed in with other household waste and collected all together. "The health risks identified in the Norwegian study which considered separate fortnightly collections of organic waste would not therefore apply."